For the paper lover: Make a chart with the month in the heading. Then list each day of the month below it, not set to any days of the week. Fill in people’s birthdays accordingly. 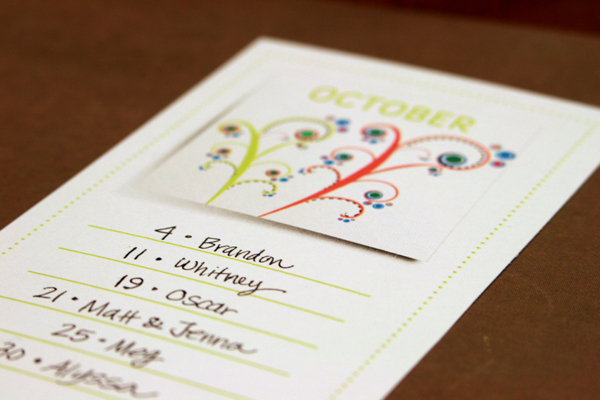 Kennalyn.com is offering this free printable birthday calendar (pictured above) on her site for a limited time. It’s free until Jan. 21. After that you can purchase if for $2. For the online savvy: Hallmark and American Greetings offer free online birthday and special event calendars. They will alert you of the approaching birthdays in advance sending the reminder to your email or phone. You can even keep an address book of people to send cards to and when it is time, you are a few clicks away from having a personal card sent. For the iPhone user: There is an app for that. Actually several apps ranging from free to $0.99. myDays seems to me to be the best since it allows you to create a personalized eCard that you can send to the person from your phone. For the computer friendly: If you are already using the calendar on your computer to organize your family calendar, simply turn on the reminder or alert for each person’s birthday. I have a “Birthdays” calendar on my google calendar. All have reminders and I can easily hide them when I don’t need to see them all.